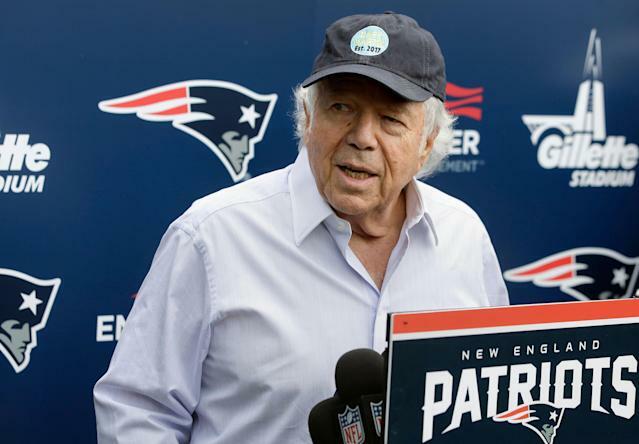 Robert Kraft’s legal team is seeking to suppress footage of the New England Patriots owner allegedly receiving sexual favors in a Florida prostitution sting, claiming it was obtained after police called in a fake bomb threat to install cameras. A memo filed in Palm Beach County on Tuesday and obtained by the Boston Globe seeks to bar the video from being shown to jurors in a potential trial. Kraft and 24 other men face charges of soliciting prostitution at the Orchids of Asia Day Spa in Jupiter, Florida. Jupiter police initiated “a phony ‘suspicious package’ warning to be issued for the Spa in order to force an evacuation, so the [police] could install hidden cameras inside several of its private massage rooms, as well as in the spa’s lobby. Kraft’s attorneys argue in the memo that the tactic is “constitutionally problematic” and reserved for “extraordinary circumstances” in cases that involve terrorism, bomb making, racketeering and other felonies. “The underlying criminal activity that was surveilled involved felonies that were far more serious than the misdemeanor prostitution alleged to have taken place here, and the justification for the invasion was far stronger,” the memo reads in relation to prior use of similar warrants. They have previously argued that the use of video surveillance was “categorically unnecessary and inappropriate” in a case where human trafficking charges have not been filed. Jupiter police detective Andrew Sharp wrote in the warrant application obtained by USA Today that health specialist Karen Herzog suspected that women were living in the spa, leading to the suspicion of human trafficking used to justify the warrant. The warrant cited a refrigerator with food and water as evidence that trafficking may have been taking place. “Sharp made his reckless leap over to human trafficking based on supposed ‘evidence’ consisting of such things as observing a refrigerator stocked with food, two beds, and clothing — all of which may be routinely observed at any number of places of employment, including law offices, for reasons having nothing to do with human trafficking,” Kraft’s lawyers wrote. The memo is the latest effort from Kraft’s legal team to suppress the potentially incriminating video. Last week, his attorneys asked the judge overseeing the case to suppress the footage.